Google makes a pretty good search engine. 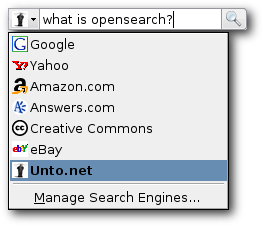 Firefox 2 and Internet Explorer 7 both support OpenSearch as a way of customizing the browser's search box. And you can make all three work together in five minutes. No programming required. Use the template below to create a file on your web server. I called mine "opensearchdescription.xml" and saved it on static.unto.net. Download the template here, save it to your server, and move on to step 2. Replace [Name of site] and [Site host] in the template above with the appropriate values for your site. Remember that [Name of site] must be 16 or fewer characters of plain text. See the live Unto.net description file here. Verify that you can load the edited template in your web browser, and move on to step 3. Tell browers that visit your site about the new search engine using an autodiscovery link. You'll want to do this on every page on your site, so it is best to edit whatever template generates the header. <link rel="search" href="[URL of the file you just created]"
Hit refresh in your web browser. If it works, the search box in the upper right of either Firefox or IE should light up to indicate that a custom search engine was discovered. Click on the drop down and select your new customized OpenSearch engine. Except where otherwise noted all portions of this article are copyright © 1999-2012 DeWitt Clinton and are made available under a Creative Commons License.